I have been waiting for this book for months! I first saw the cover reveal for this book and was taken by how beautiful it was. Out of all the books coming out next year- THIS is the one I had to get my hands on. It was absolutely worth it! 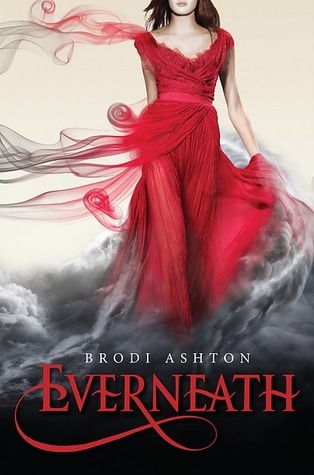 Everneath is a modern take on the story of Euridyce and Orpheus and also Hades and Persephone. It is a combination of many mythological stories about the underworld. This mythology is heavily apparently throughout the entire story. This is not a child's mythology book, hoewever. Everneath is a dark and creepy tale about a girl's escape from her future in a not -so- pleasant Underworld. The story of Persephone and Hades is one of my favorites, and it was honestly hard for me to read a tale about romance and the underworld written so darkly. The underworld is not somewhere that you would want to go- it is evil and wouldn't be a pleasant experience. Most of the story deals with Nikki and her readjustment back into the land of the living. (Literally). She has to deal with her boyfriend, Jack, and her friends. Cole, the immortal who brought her to Everneath has followed her into the world to try and coerce her to come back to Everneath with him forever. The main love story in this book is not Cole and Nikki. I appreciated that. It was nice to read about the nice guy (Jack) getting the girl and the "bad boy" being left out in the cold. I get tired of reading about the 'bad boys" who are just deeply wounded and lonely. I cheered for Jack and hoped that he would win out in the end. All in all, I really enjoyed this story. It was nothing like what I expected, and I was very confused for the first few chapters, but I really enjoyed the "countdown' that Nikki had left in life. I am looking forward to the next book in this series! I really enjoyed this book as well and will be reading the next one in the series for sure! I have this book on my TBR list and can't wair for this to come out. one of the top 10 on my To-Read list for 2012, It does not hurt that the cover is so beautiful. Great Review! This is one of my books on the my TBR list this month! I've been this around for a while now I really do like how this book is. I will differently read it ^^ thanks for the great review!! I love the cover on this one and I've heard so many good things about it. I've got to get me hands on it! The cover is so beautiful and intriguing. I can't wait to read it.